This morning, bright and early, much earlier in fact, than I was planning on starting my day, the doorbell rang. The courier took one look at me and apologized several times for waking me up (there was no faking, the “I’m really awake” thing… nope. No chance of that). He then assured me that it was -20 and truly horrible and I should go back to bed. We had been out monstrously late at an annual event that we cherish- dear friends of ours who have the hospitality gene big time, have a gorgeous gathering once a year. It’s their ‘Chocolate Party’. They make fabulous handmade chocolates and then invite their musician friends and spouses to make and enjoy gorgeous music and eat heavenly chocolate. I ate too much chocolate and enjoyed the bliss of spectacular music and promised myself a late start to Monday morning. Which didn’t quite happen, but believe me, the package that arrived was worth hauling my post-chocolate weary self out of bed for. See what I mean? Wouldn’t you jump out of bed, no matter how few hours you’d slept and how much chocolate you’d eaten the (verrrrrry Late) night before? 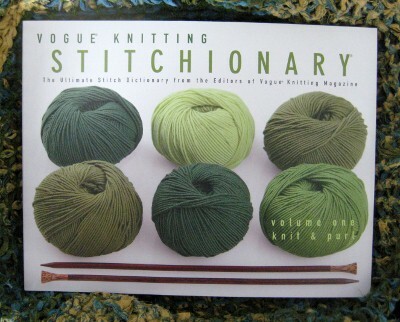 If you knit, you want this book. If you don’t knit, you will want to learn. The VK Stitchionary is better than chocolate, and that is saying a lot. Although…. I have to warn you that it may interfere with your sleep, as it is a real page turner and ‘Ooooh…. gotta have that, gotta do that….’ is certainly going to be a theme as you browse through it. Okay, I’m convinced. If you’re this impressed with it I’m going to look for this book.